The annual National Spelling Bee is underway. Yesterday the 275 contestants took a written spelling test. Today they started spelling words on the stage. Fifty of the kids will advance to the semifinals tomorrow, and tomorrow night at 8:30 p.m. ESPN — ESPN! — will broadcast the final rounds. I was a good speller as a kid. 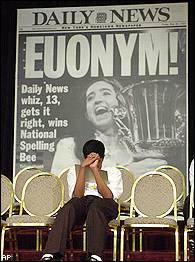 I used to enjoy the spelling contests between classroom teams in grade school, and I competed in at least one all-school spelling bee that I can remember. But I never had the kind of dedication to spelling prowess that the kids competing in the National Spelling Bee have displayed. They spend hours studying lists of words, reading dictionaries, memorizing spellings, and developing strategies to aid in the recall process. As a result, they can spell words that even the most well-educated among us would likely never use in normal conversation. You can tell the National Spelling Bee is a throwback event by its name. Are any other contests called “bees” anymore? But the format is tried and true, with the kid leaving her chair to stand up behind the microphone, hearing the word, perhaps asking for a definition and to have the word used in a sentence, and then giving it her best shot and hoping she doesn’t have to slink back to her chair in failure. The contestants don’t do it because it is cool, or because champion spellers will make millions of dollars in professional leagues. No, they do it because they like being good spellers and like the idea of seeing whether they just might be this year’s champion. And that, I think, makes the National Spelling Bee cool after all. Recently this simple shrine appeared along our walking path, at the base of the Ashton Grove sign at the corner of Yantis and Route 62. It commemorates Bungee, a New Albany police dog. Bungee was New Albany’s first-ever police dog. He was a Belgian Malinois whose primary duty was narcotics detection, but he also was used in community outreach functions and school programs. He was trained to immediately leave the police car he rode in when an automatic door opened. Unfortunately, on the evening of May 25 the door opened in error and Bungee jumped out into moving traffic, where he was struck and killed. 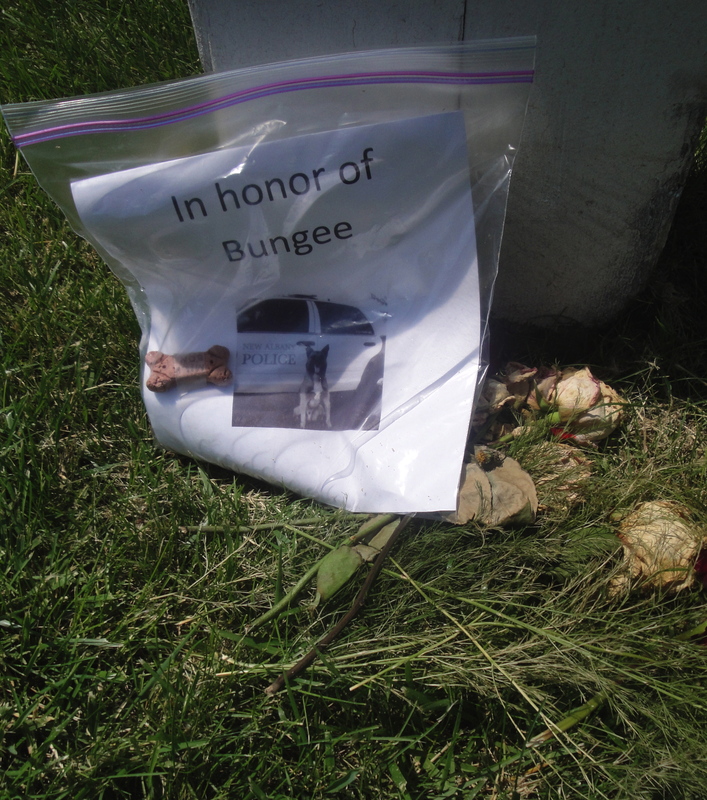 This poignant little shrine to Bungee, with its picture, dog biscuit, and faded flowers, reminded me that dogs are not just pets, but also important working members of American society. There are police dogs like Bungee, and seeing-eye dogs that assist the blind, and explosive-sniffing dogs who are out doing their jobs every day. Recently, we’ve also heard about the brave Seal Team 6 dog that parachuted into the Pakistani compound in search of Osama bin Laden and the search-and-rescue dogs going through the rubble in Joplin, Missouri and other towns ravaged by tornadoes and powerful storms. I’m confident that all of those dogs perform their work faithfully and gladly, with a pant, and a wagging tail, and hopes for a dog biscuit and a pat on the head. They’re not called Man’s Best Friend for nothing.